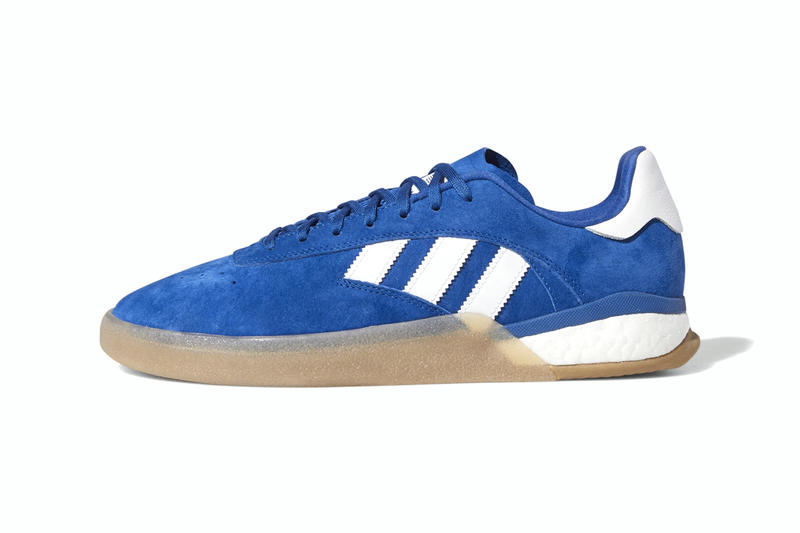 adidas Skateboarding is returning to its line of 3ST sneakers with the 3ST.004, tested and adapted by adidas Skateboarding team rider Tyshawn Jones. Taking its design language from the 1983 Kelger Super OG, the 3ST.004 equips adidas’ BOOST technology for an energy-returning, stability enhancing midsole. With molded heel clips, the blend of BOOST and elevated skating hardware allows for a responsive sneaker packed with protection, durability and board control. Dropping in “Orange/Black/White,” “White/Black/Gum,” and “Royal/White/Silver,” the 3ST.004 combines a premium pigskin nubuck upper and leather panelling with a hardwearing rubber-wrapped midsole, adding a touch of luxury to adidas Skateboarding’s 3ST performance line. The 3ST.004 will first release on adidas’ UK site on February 6, 2019, as well as instore and at select retailers. In case you missed it, take a look at the YEEZY BOOST 700 “Inertia” on foot.